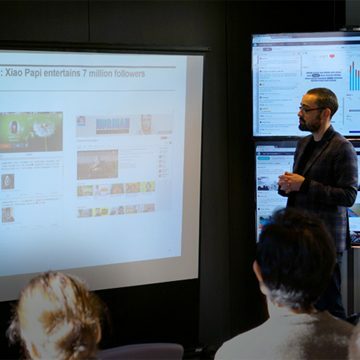 On March 17th, Linkfluence and Labbrand, a leading China-originated global brand consultancy, organised a breakfast to discuss the Chinese social web. It was a chance for Guilhem Fouetillou, Chief Evangelist Officer at Linkfluence, Nicolas Farman, Director of Labbrand France, and Amy Loa, Labbrand's Digital Manager, to provide a breakdown of this challenging but also crucial world for brands. In China, social networks have a colossal penetration rate. Two major networks, Sina Weibo and WeChat, respectively have more than 200 million members and more than 600 million active users. The social web represents a separate universe, with its own customs, major players and trends. It is vital that brands adapt to these if they wish to achieve successful international growth. In collaboration, Labbrand and Linkfluence have identified 3 keywords for structuring brand action: Huge, Mobile and Sophisticated. The Chinese social web is about immense scale. Approximately 688 million people, more than 50% of the Chinese population, currently use the internet and 77% of users regularly connect to social media apps. Consequently, there are exceptional levels of influence for local key opinion leaders: actress Yao Chen has 80 million followers on Sina Weibo. The repercussions are also commercial; China is the country with the highest average monthly online purchases in the world. Chinese e-commerce now represents 35% of the global market. In China, mobile is now the most popular tool for accessing the web. 90.1% of internet users connect via their mobiles, and 18.5% connect solely in this way. This has very clear business consequences: in China more than 360 million people use mobile for online payments. While Westerners remain attached to using the web at home, especially for major purchases, the Chinese have developed a much broader and more confident use for their mobiles: buying aeroplane tickets, shopping, looking for restaurants, renting cars or even playing the lottery. While many Western countries still struggle with the issue, the Chinese have long been able to connect to the internet when using the metro. The boundary between digital and real life is gradually disappearing and internet connection is becoming a continuous state of being. For B2B, the most popular communication option in China is instant messaging. Meanwhile, for conversions, Alipay, the Alibaba Group's online payment solution, has 400 million active monthly users on mobile. Its features have evolved beyond connecting to a bank account and have won over many digital consumers, who are able to buy shares, find special discounts and invest money at appealing rates. China is one of the largest markets in the world, and also one of the most digital. The dual objective for companies wanting to gain a foothold in China is not only to understand the culture of its consumers, but also their digital culture. In both cases, the fundamental mistake is seeking to duplicate strategies in different countries. On the contrary, the brand must be localised and adapted to local habits. Brands need to make a humble start from scratch in order to develop real expertise on this market. Since the creation of Linkfluence Asia in October 2015, Linkfluence has been supporting brands in their Asian development using insights drawn directly from Chinese social media by experienced local teams of data scientists and social media researchers. With this new service, Linkfluence is offering international groups a decisive competitive advantage: a guaranteed level of quality worldwide support from local specialists, positioned close to their strategic markets. Would you like to find out more? If so, please get in touch.